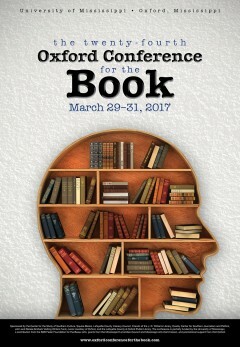 For those who relish getting lost in a good story, the 24th annual Oxford Conference for the Book is an opportunity to gather with authors, editors and scholars. On March 29-31, the conference at the University of Mississippi, which is free and open to the public, includes readings, panel discussions and lectures by award-winning writers and first-time novelists. Events will take place across the UM campus and in Oxford. The conference begins with a welcome luncheon at 11 a.m., sponsored by the Friends of the Library, in the Faulkner Room in Archives and Special Collections in the J.D. Williams Library on the UM campus, followed by a lecture by Jay Satterfield, special collections librarian at the Rauner Special Collections Library at Dartmouth College, at 11:30 a.m.
Satterfield, who was in Oxford for the Faulkner Conference in 2015, said some of the ideas he first presented then have new relevance for writers trying to navigate the shifting landscape of today’s publishing world, and he is looking forward to exploring those ideas in a new context. “I will discuss the skillful and timely marketing strategies Random House employed to re-establish the Faulkner brand—a brand that would later help to cement Faulkner’s place in the American Literary canon,” Satterfield said. Other panels on Wednesday and Thursday take place on campus at the Overby Center for Southern Journalism and Politics, the University Museum and Southside Gallery. Friday’s panels take place in the historic Lafayette County Courthouse. Conference panels explore a wide range of topics, including nature writing, African American cookbooks, the life and work of Harry Crews, working with an editor, literature as activism, and the National Book Award. The full lineup and registration for social events is at oxfordconferenceforthebook.com. George Gibson, executive director at Grove Atlantic, reflects on the process between editor and author during his more than 40 years in the business at a panel Wednesday at 1:15p.m. “I’m thrilled to be coming to the conference as it brings together all the constituencies in the book world in a storied location in American letters,” Gibson said. Additionally, this year’s participants also include poets Ann Fisher-Wirth, Aimee Nezhukumatathil, Beth Ann Fennelly, Carolyn Hembree, Alison Pelegrin and Rodney Jones; memoirist J. Drew Lanham; biographers Carolyn J. Brown and Ted Geltner; documentary filmmaker Tom Thurman; American studies professor Sharon Monteith; art historian Beth Batton; UM English professor Annette Trefzer; executive director of the National Book Foundation, Lisa Lucas; foodways writer Toni Tipton-Martin; editorial director of Lee Boudreaux Books, Lee Boudreaux; journalist David Shirley; novelists Peter Heller, Beth Macy, Hari Kunzru, Michael Farris Smith; and comedian-writers Trae “The Liberal Redneck” Crowder, Drew Morgan and Corey Ryan Forrester. On Wednesday evening the gala opening-night cocktail reception/dinner will be held at 6:30 p.m. at the historic Barksdale-Isom House, 1003 Jefferson Ave., with food provided by James Beard award-winning chef John Currence’s Main Event Catering. The conference is pleased to partner with the University Museum again this year to include a session paired with an art exhibition. On Thursday afternoon, the museum will host a session with Carolyn J. Brown, who wrote painter Kate Freeman Clark’s biography, art historian Beth Batton, and co-curators of an upcoming exhibition on Freeman’s work, James G. Thomas Jr., associate director of publications at CSSC, and Annette Trefzer, UM associate professor of English. An opening reception for the exhibition and book signing by Brown will follow the session. As in years past, Thacker Mountain Radio will host a special Oxford Conference for the Book show Thursday, March 30 at 6 p.m. at the Lyric Theater, 1006 Van Buren Ave., including conference authors and visiting musicians. Two new special events will take place this year. On Thursday at 8 p.m. there will be a screening of Tom Thurman’s documentary “Harry Crews: Guilty as Charged” in Lamar Hall, Room 129 on the UM campus. On Friday night, the conference welcomes the wellRED Comedy Tour to the Lyric Theatre. Earlier that day, Trae “The Liberal Redneck” Crowder, Drew Morgan, and Corey Ryan Forrester will discuss their new book, “The Liberal Redneck Manifesto.” The film screening and reading are free, but tickets are required for the comedy show. The 2017 Children’s Book Festival, held in conjunction with the Oxford Conference for the Book, will be at the Ford Center for Performing Arts on Friday, March 31, with more than 1,200 first graders and fifth graders from the schools of Lafayette County and Oxford in attendance. Chris Van Dusen, author of “If I Built a Car,” will present at 9 a.m. for the first graders, and Chris Grabenstein, author of “Escape from Mr. Lemoncello’s Library,” will present at 10:30 a.m. for the fifth graders. The Lafayette County Literacy Council sponsors the first-grade program and the Junior Auxiliary of Oxford sponsors the fifth-grade program. All 1,200 children receive their own copy of each book. At noon March 31, the Lafayette County and Oxford Public Library will host a poetry talk and lunch with poet Alison Pelegrin. Both the lunch and talk are free, but reservations are appreciated. The Oxford Conference for the Book is sponsored by the Center for the Study of Southern Culture, Square Books, the University Museum, the Lafayette County Literacy Council, the J. D. Williams Library, the Overby Center for Southern Journalism and Politics, the John and Renée Grisham Visiting Writers Fund, the Junior Auxiliary of Oxford, and the Lafayette County & Oxford Public Library. The conference is partially funded by the University of Mississippi, a contribution from the R&B Feder Foundation for the Beaux Arts, grants from the Mississippi Humanities Council and the Mississippi Arts Commission, and promotional support from Visit Oxford.